Some of you may read this title and think that you are not failing in practice and that your business is doing ok.
After all, many small businesses go broke are burn out within three years. And that’s not you, right? RIGHT? But are you really living a life full of FREEDOM, meaning, income and impact that you dreamed about when you first entered the profession? Or are you settling for less than fulfilling relationships, parenting situation, vacations, checkbook balance and/or a frantic, stressful pace that doesn’t deliver what your goals or dreams had promised? For some of you, the lack of success in these areas is now and in the present. For others they can enjoy success in one area and fail in the other – now or later. And still others will come to the end of their chiropractic journey to discover the road didn’t take them where they wanted to go. Here’s the problem with the chiropractors who sputter and fail on the route to heavenly practice or personal life bliss: they work on their MINDSET. Chiropractors work on their mindset because that’s what all the coaching schools and personal development folk teach. “When you believe you can achieve” and other nonsense. Worse, when chiropractors begin to flail or fail in these areas, they either get distracted and attempt to solve a different problem (Ex: we need more new patients, a better website, more certifications, etc) or they begin building their rationalizations and excuses for why they are struggling. And, of course, the first thing they do is to look for a few examples of chiropractors who are also doing badly to support their theory that everyone must be doing poorly. It’s not secret that today’s chiropractors are working too hard, for too long, for too little. Worse, too many are stuck in models, modes and mindsets that prevent them from working smarter. The traditional model for chiropractic practices that many DC’s have built their business upon is dead. Or at least for some, it’s the Walking Dead. The “ground” that you’ve built your practices on isn’t the only ground available. There’s better, more solid ground out there – the high ground. Claiming and holding onto the high ground in your local market not only makes some of the threats that face chiropractors irrelevant (or at least minimizes their impact), it actually allows you to move towards your true purpose of becoming a chiropractor in the first place. In other words, to move boldly in the direction of your dreams and goals! After years of speaking, coaching and consulting with chiropractors on how to work smarter in practice (and in transitioning out), I have been privileged to meet DC’s from all 50 U.S. states and many countries and I have discovered exactly ZERO doctors whose goals included mediocrity, struggle and not reaching their true potential in business and in life! No one endures years of schooling to become a chiropractor who will merely “survive” in our profession and eek out a meager existence, then one day close up their shop and crawl into their grave. You became a chiropractor to THRIVE! So here’s some more good and bad news. We are moving into the fourth quarter of this year and if you are not setting records in your practice, fulfilling your personal dreams and loving your existence on this planet and in chiropractic, it’s time for you to do a quick reality check and look inward at the path you have chosen. It’s time for you to rise up and look around you and realize that excuses are running thin. Are you on track to achieve your best year ever professionally? Are you working on specific items to help reach (or come near) your collection goals? Is chiropractic providing you with the income to live the lifestyle you desire? Is your practice (or job) providing you with the freedom you want? Is chiropractic enabling you to live a life full of meaning and giving you the TIME to pursue your personal goals and passions? Do you have plans for how you will transition, sell your practice or thrive after chiropractic? If you answered “No” to ANY of the questions above, you need to seriously question where you are in practice (or in life) right now! The economy is going great right now. Some chiropractors are inundated with patients. Some chiropractors are on track to beat their collections records and meet their personal goals. And they are in the very same market spaces as you. Filled with patients who want only the minimum care their insurance will cover, who don’t get the “big idea” and who are challenging to deal with. These chiropractors have identical documentation and compliance requirements, are subject to similar audit threats and wrestle with payer policies just like you. In other words, the same problems that exist in your practice exist in theirs – with one big difference. Their practice is thriving and yours…? If we learned one fact from the Great Recession of 2008, it should be this: all the positive economic momentum can go away very quickly. For some, it felt like they were enjoying wealth and prosperity; and an instant later it was gone. Instead, it is time to rise up and profit from the current trends that are going on without risking your neck, your back and your sanity! It’s time to look outside our chiropractic bubble and realize that dentists, orthodontists and other health professionals are booming. 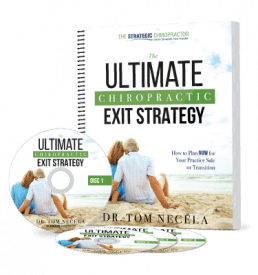 It’s time to look inside our profession and learn from examples of other chiropractors who are thriving in their practices – and find common denominators, bonds and strategies that you can apply inside your business as well. It’s also time to realize that the word “practice” is very poorly applied in that it leaves us with the impression that there is the “real” game or event out there somewhere beyond what we are doing now. Doctors, this is it! This is your time to get your business right. There can be second chances but there is no second life to do it all over again, better in the next realm. Talk to chiropractors who are ready to retire (or forced to) like I do every single day and you will find a common thread in the conversations: make the most of the time you have now and the days you have been given because you never know when your health will be taken from you, when you will become too tired to trudge on or where your practice will hit its peak. Mostly, it’s time that we stop making excuses because there will never be a “perfect” time or a perfect opportunity where everything will align magically and smoothly without any effort on your part. My tagline may say “work smarter” but do note that the word “work” is in there. For those of you who are stuck in a dead-end job where you are slaving away for too little, with no future, and no learning curve, plan your departure or leave now. I started as an associate too and I understand that there is a time and place to learn. I understand that not everyone has the financial resources to go out on their own. But I also understand that there is a time to declare that your future success is up to you. If you’re having trouble making that decision, I’d recommend you view our FREE Buy, Build or Break Up Webinar where we will be discussing these issues in detail to discover the best strategies for purchasing a practice, starting one from scratch or getting a new associate job. Finally, if you are nearing the light “at the end of the tunnel” maybe it’s time for you to avoid the biggest mistake many chiorpractors make in the end and/or to capitalize on the fact that your practice is doing well and begin a transition plan for your practice. Or maybe you are done –ready for retirement or ready to move on to another pursuit. You should definitely check out our FREE Sell, Switch or Slow Down Webinar where I will be discussing how to maximize the value of your chiropractic practice sale or transition and minimize costly mistakes. 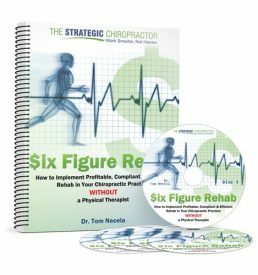 Over 6000 chiropractors have taken this webinar to help solidify or start their transition plans, you should too! As I wrap up, I realize that I’ve undoubtedly pushed a few buttons here in the hopes of getting you moving in the right direction. My intention is not to irritate or offend, but motivate you to achieve more for yourself, your patients and our great profession. For some of you, there’s a need to improve your income so that you can afford to have more time and freedom. For others, you’ve got the money, but time is slipping away. My resources offered above are free. Now, the choice is yours of whether you will take advantage of them and take the wheel of your practice or career to steer it in the direction of your goals and dreams!